If it wasn’t for Sachio Semmoto, the landscape of Japan’s communications industry would look different today. The 76-year-old business magnate has been linked to the three major communications giants — NTT Corp., KDDI Corp. and SoftBank Group Corp. — in his eventful career. In short, Semmoto started out at NTT but quit there to co-found KDDI’s predecessor and later founded another communications startup that he eventually sold to SoftBank. With his keen eye for divining the next technological trends, Semmoto has embarked on a new adventure: shaking up the energy industry with renewable power. “I want to somehow make Japan one of the leading renewable energy nations in the world,” he said in a recent interview. Semmoto says green energy is one of the next big things amid the growing mood to combat global warming, while he believes Japan is obliged to shift to renewable energy given the failure to avoid the Fukushima nuclear crisis. 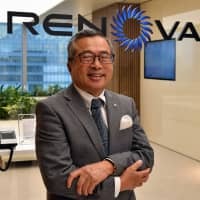 Now chairing Renova Inc., a Tokyo-based green energy company, the veteran entrepreneur says he aims to build the company into something as big as the regional power utilities, such as Tokyo Electric Power Co. Holdings Inc., while also fostering young business leaders. It is important for businesspeople to observe what’s going on in society to identify issues and technological trends, Semmoto says. He himself has pinpointed social changes that were about to happen and made a business out of them, namely the telephone communication competition in the 1980s and broadband internet connections in the early 2000s. In his view, one of the hottest trends worldwide now is renewable energy. Considering the historic Paris accord in 2015 and the rising ESG (environment, social and governance) movement, “you can’t stop the momentum anymore,” he says. In its long-term energy strategy revised in July, the government promised to accelerate efforts to make renewables a major source of energy by 2030. Since 2014, Semmoto has been overseeing operations at Renova, which runs renewable power generation businesses, including solar, wind, biomass and geothermal. “I’ve always been interested in green energy,” says Semmoto, who also co-founded a wind power startup called Eco Power Co. in 1997. While Japan is still lagging behind other countries, especially those in Europe, in the area of renewable energy, a shift has been quite obvious in the past several years. One defining incident was the catastrophe at the Fukushima No. 1 nuclear plant. “I think Japan should be green-energy dominant country because of the Fukushima crisis,” Semmoto says. Before Fukushima, “I thought Japan needed nuclear power plants. … I studied nuclear reactor control, so I believed Japan’s engineering technology could control the reactors,” he says. But as he watched the crisis unfold, in which three Tepco reactors suffered meltdowns, “my belief collapsed like a house of cards … I was wrong,” Semmoto says, adding that nuclear plants are not suitable for Japan, given its frequent earthquakes and many volcanoes. 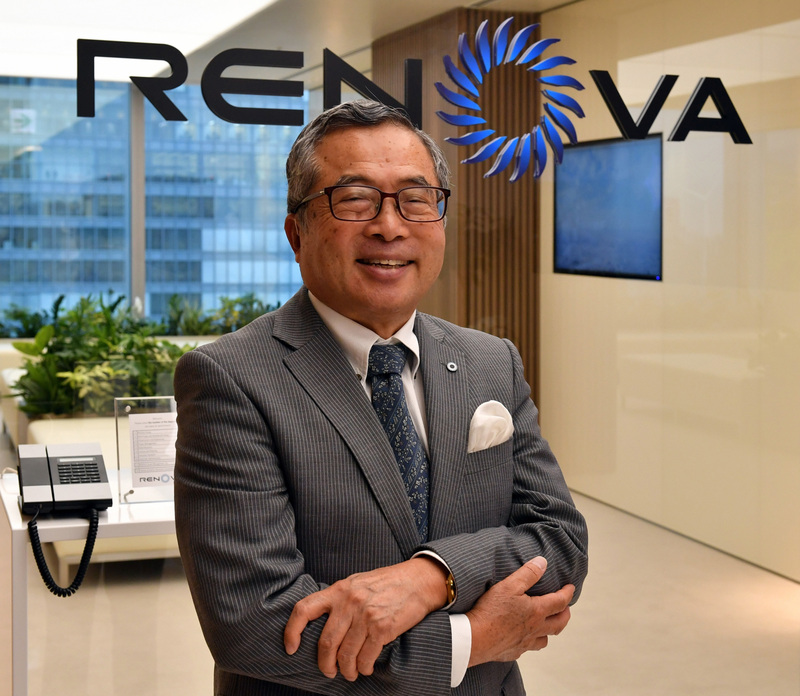 Then he met Yosuke Kiminami, founder and CEO of Renova, who asked him to join the company. This lit a spark, firing a desire in Semmoto to spread green energy. He says he is now laying the groundwork to transform the 18-year-old firm into a big power enterprise. Thus, rather than micro-managing daily operations, Semmoto’s role is the big picture, including setting an overarching vision, scaling the company and communicating with society. After Semmoto joined the company, Renova listed its shares on the Tokyo Stock Exchange’s Mothers section in 2017. Renova was bumped up to the TSE’s first section this year. The Renova’s market cap was around ¥93 billion as of Tuesday, but Semmoto is aiming higher. “From my point of view, we need to take the market cap to ¥1 trillion, meaning the same level as the regional utilities. Then I think the company will be one of the prominent renewable power companies in Asia and the world will recognize us,” he said. Building a ¥1 trillion company may seem like an overly ambitious endeavor. But it seems more realistic when Semmoto is involved. KDDI Corp., whose predecessor, DDI Corp., co-founded by Semmoto, now boasts a market cap of over ¥6 trillion. Yet Semmoto describes his career path as rather ordinary up until he quit as a salaryman. Semmoto’s career started at Nippon Telegraph and Telephone Public Corp. in 1966, a predecessor of the NTT group firms. He was an elite salaryman but started to question the situation in which NTT, as a public entity, was monopolizing the business of setting up the telephone communications network nationwide. “There had to be healthy and fair competition,” Semmoto recalls, adding that in the United States, competition already existed among phone companies in the 1980s, offering customers choices. Having studied in America to earn a doctorate, he was well-versed in technological trends there. From around 1983, Semmoto started touting the need for competitors against NTT, which was set to be privatized in 1985, saying just privatization was not enough. “Meeting with such a great business leader was the trigger. I don’t think I would’ve founded (DDI) if I hadn’t met Mr. Inamori,” recalls Semmoto, adding that Inamori taught him a great deal about business leadership. Inamori agreed to invest in and co-found DDI with Semmoto. At age 41, Semmoto quit NTT, a move that seemed reckless to many. 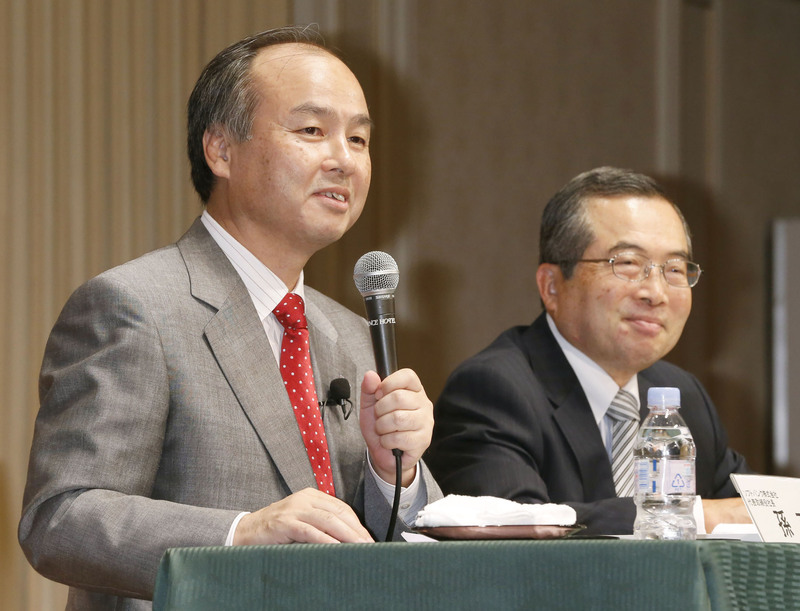 They thought a startup was no match for the power of NTT, which had more than 300,000 employees. Yet DDI grew over the years, and when Semmoto left in 1995 after 12 years, it had become a listed company with more than 5,000 employees and ¥500 billion in annual sales. In 1999, Semmoto dove into another technological trend when he founded eAccess Ltd. to facilitate the spread of broadband internet connections in Japan. At the time, the country was slow to adopt such technology and Semmoto felt a sense of crisis that Japan would be left behind. “It’s important to make a profit, but the foundation of my business mission has always been getting hands on fundamental social infrastructure and bring changes to solve contradictions,” he said. EAccess started as a wholesaler of ADSL internet services but later launched a mobile phone carrier business known as eMobile, which became the fourth-largest carrier after NTT Docomo, KDDI and SoftBank. 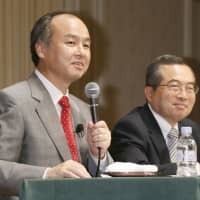 SoftBank eventually bought eAccess for ¥180 billion in 2012 to acquire its mobile communications networks and user base. Another mission of Semmoto has been fostering young entrepreneurs, telling them to constantly go and seek out the world’s latest trends with their own eyes. When he co-founded DDI, Semmoto sensed the telephone communications revolution would be hitting Japan with the privatization of NTT. He made the move to establish eAccess because he believed the internet would change society. “You need to see the world whenever you have the chance. It’s OK if it’s a cheap trip (if you don’t have money), but you need to see the world yourself,” he said, adding that studying in the United States helped develop his sense of entrepreneurship. “Unless you go out in the world, you don’t realize what’s happening in Japan. New business chances come from contradictions in society, but you won’t be able to identify them” if you don’t see what’s happening in other countries, he advises. When it comes to running a business, finding the right partner — like when Semmoto met Inamori — is crucial, he says, emphasizing that trustworthy allies increase the odds of growing a business. “Find someone who can change your life in a real way,” he says. 2015 Becomes chairman of Renova Inc. This section runs exclusive stories on top business leaders and executives interviewed by The Japan Times. NTT Corp., SoftBank Group Corp., KDDI Corp., Sachio Semmoto, Renova Inc.